The spiral galaxy NGC 6503 is seen in this view of combined images taken by the Hubble Space Telescope. The galaxy is 18 million light-years from Earth in the Local Void, a region so sparsely populated by stars and galaxies that scientists billed NGC 6503 as "lost in space." Poised on the edge of a galactic desert is NGC 6503, a galaxy that appears so alone in the universe that some scientists have called it "lost in space." The galaxy takes center stage in a new image from the Hubble Space Telescope, which shows NGC 6503 shining in visible and ultraviolet light, with different colors denoting zones of gas and star birth. NASA and the European Space Agency unveiled the image on Wednesday (June 10). 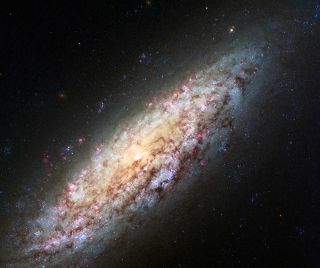 "The galaxy's odd location on the edge of this never-land led stargazer Stephen James O'Meara to dub it the 'Lost-In-Space galaxy' in his 2007 book, Hidden Treasures," NASA wrote in an image description that labeled NGC 6503 "lost in space." Hubble's image shows a variety of zones within the image, which is about 30,000 light-years across or a third of the size of the Milky Way. Red patches in the image denote gas, blue contains new stars, and dust lanes (in dark brown) stretch across the lighter arms and center of the galaxy. The images are based on two sets of observations collected by Hubble, first in 2003 (by the Hubble Advanced Camera for Surveys) and then in 2013 (by the Wide Field Camera 3.) The final image was released on Wednesday. The Hubble Space Telescope is celebrating 25 years of operations this year. It is one of NASA's most famous space telescopes. Among its many discoveries, the Hubble telescope has helped narrow down the age of the universe and provided more proof that stars form from zones of gas. One advantage of Hubble's long life is it allows astronomers to revisit images they took before, to see how the zone has changed or evolved. One recent example of this was watching the disintegration of the famous "Pillars of Creation"in the Eagle Nebula, NASA officials wrote.